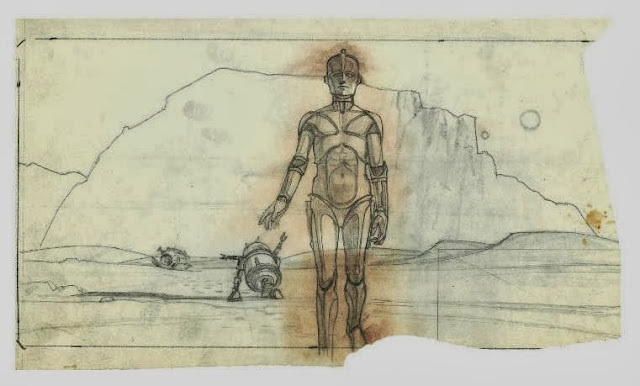 The internet was quick to suggest where the inspiration for the lil dude or dudette came from – the mind of Ralph McQuarrie – being the original concept artist / designer that George Lucas employed to bring his words to life by way of drawings. 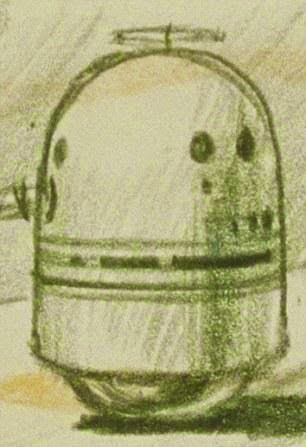 Here’s an initial sketch of what could have become R2D2 and has duly become a part of The Force Awakens (just like the series Rebels has been doing). You'll note the roller ball at the base of the draft sketch - it's clearly an inspiration. You can see how the top is very similar to the traditional R Type Mech droids we have been used to seeing over the years. "Astromech droids are a series of versatile utility robots generally used for the maintenance and repair of starships and related technology. These small droids are often equipped with a variety of tool-tipped appendages that are stowed in recessed compartments. The R2 unit is a popular example of an astromech droid."